Why Are Marijuana Stocks Dropping? Why are marijuana stocks dropping right now and what shall we do about that? The year 2017 was an extraordinary year for cannabis stocks, many of them doubled, tripled, quadrupled; the big caps like TSE: WEED or TSE: ACB started to record significant revenue increases while lowering production costs. From a trading perspective, the cannabis industry experienced literarily a trading spree. People got crazy about that and the overall index got simply overbought. Interested in cannabis industry? Check the most recent articles about current marijuana situation here! The industry needed the consolidation, that has been happening so far. The clever money players notice that the cannabis sector is a candidate for the top performer of the current year. Hedge funds have been pumping money in the individual stocks, big companies selling alcohol and brewers are arranging partnerships with cannabis producers. The marijuana companies have been investing in capacity expansions, new products, focus on the international market (e.g. German, South Africa, etc…) and cooperation with dispensaries or fancy shops. As the consolidation was sliding the price over the stock’s support levels, more and more market participants started to speculate how to use this money elsewhere. (“At the end of the day, a recreational pot is starting to sell in Canada on 16 October, why should I let that cash rotting here, if I can make money on FANG stocks in the meantime? !”) As the earnings season started this week, people decided to move money between the industries and that is the main reason why marijuana stocks have dropped. Look at QQQ below, while pot stocks dropped yesterday, QQQ has risen big time. People are speculative in short-term. Masses are expecting good earnings and thus they move their money as they feel is right. During the consolidation, some companies do better and some do worse. When you look at the marijuana index that tracks all the cannabis firms in North America, you might get a slightly distorted picture of the health of the sector. This index tracks all the companies and many of them are the scam, many of them do not even have a license and hardly will obtain in the future. A good benchmark of the industry trend is HORIZONS MARIJUANA LIFE SCIENCES INDEX ETF (HMMJ) that is focused on a relatively vast array of good cannabis stocks. HMMJ broke its resistance (orange line) and started to trend upwards prior to a legalization poll. Later it had broken down the supports of 20 EMA and 50 SMA recently which triggered even further sell-off. The price drop of recent two trading periods is significant while the volume among the same period is insignificant. This represents a judgment that volume as a current most important technical indicator very little supports the price decrease. Thus, the recent drop should be rather considered as a short-term pullback. If that is the case, then everybody would wonder when to go LONG now? Mr. Rothschild said that time to buy is when there’s blood running in the streets. Well, I wouldn’t say we have blood leaking down the road, but he’s got a point and we can use this saying as a lighter decoction of a current situation. Even though this is a young ETF, the 200 SMA started to make sense. Last time the price approached it, a rebound really happened. Now we are again getting closer. Fibonacci retracements applied to the chart give extraordinary 50% level. However, the very important element would be a signal that we can observe using technical indicators. RSI is not yet oversold (oversold is 30 or below), hence the price may still drop! Finally, the buy signal would be interpreted by MACD line crossing signal line and Slow Stochastic needs to slope up like depicted by the green arrow. As already mentioned above, some companies do better and some do worse, therefore it is important to know the companies’ strategy, fundamentals, business models, etc… HMMJ is the good benchmark, however, there are also other good companies that are perhaps smaller, but in fact with much higher potential for growth in the future. 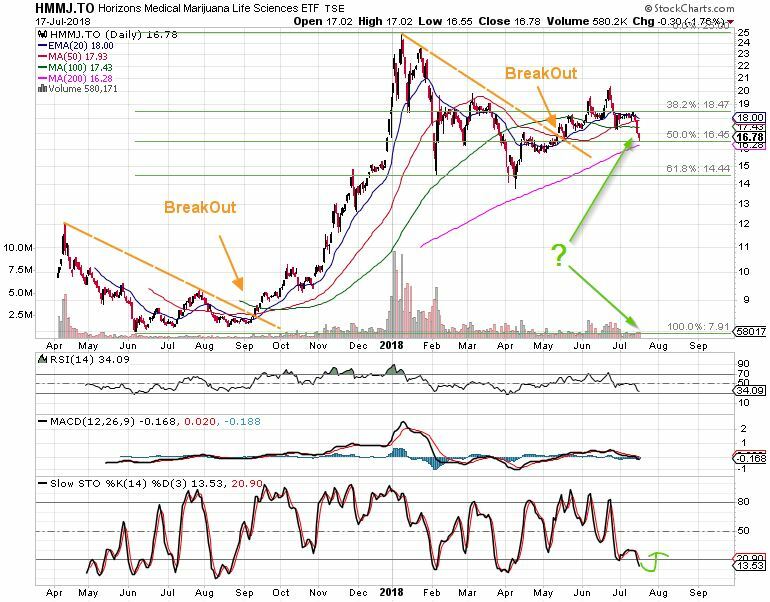 Trade Via Trend keeps an eye on the industry and regularly publishes articles of healthy pot stocks that might fly high within this top speculative sector of 2018. Investing in the young cannabis sector provides incredible opportunities. The industry still trends upwards and patient investors will be surely rewarded well in the future. Current pullback provides a great possibility for early investors to enter the stock market. The most impactful element of this business is to disallow your feelings to outfight the foundations of your strategy based on facts an analyses. Stay disciplined and focus on the big picture! If you like this article, please share it using below buttons or any other way you wish! This post is only an opinion of a contributor. It serves for informative and educational purposes only. The article is not an investment recommendation. Trading any financial instrument involves risk and thus, you should consult every financial decision with your financial advisor. Read our full disclaimer! !